In-season figs are a true treat. Here, the fruit meets Tequila, agave, licorice, thyme and lime in a perfect twist on a summer or fall margarita. 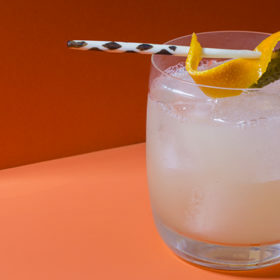 Think of this cocktail as a fall-friendly margarita that incorporates the herbaceous freshness of blanco Tequila and draws in rich notes of fresh, in-season figs. It’s ideal to bridge the early autumnal days when it’s no longer frozen margarita weather, but also too mild to break out the Cognac and other darker, warming spirits. Figs are in season twice a year. The first, or “breba” season, is during the first few weeks in June. The second, or “new wood” season, lasts longer, typically from August through October. The most common variety is the sweet Black Mission fig, followed by mild Brown Turkish and Green Kadota. 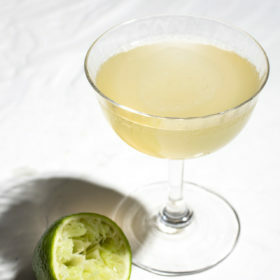 The Kadota is nearly seedless, which makes it ideal for cocktails. Can’t find fresh figs? 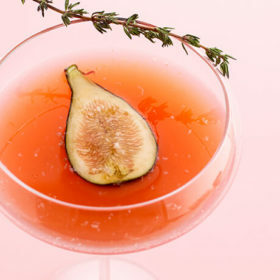 Add fig preserves, purée or jam into the cocktail shaker instead. In cocktail shaker, muddle 1½ figs and 1 sprig thyme with muddler or back of spoon. Add Tequila, lime, agave syrup and ice. Shake well, and strain into coupe glass. Grate fresh licorice root on top. Garnish with remaining fig half and thyme sprig.